Guy worked with us to clean, repair, and re-point a 1875 Victorian private home on Seaton Street, in Cabbagetown. Our masons were consistent and meticulous with their work. Craig, our assigned site manager was easy to communicate with and worked with us to get the details just right. The final product exceeded our expectation. We look forward to working with them next on restoring and rebuilding a few interior fireplaces. Great service. Installed a liner to get our old fireplace working again. Did a good job and cleaned the job site completely when they were done. Even dealt with a difficult neighbour. Would definitely recommend them for similar work. We hired Bowman Masonry to fixed a broken window sill and fill in some missing bricks around the outside of our house. We have an older house and they were the only masonry company that would guarantee that they could find bricks that would match the existing ones. We were very pleased with the personalized service. They did a wonderful job and made sure to follow-up afterward to ensure we were satisfied. So sorry to hear this and will ensure the production contacts you and we remedy this right away. 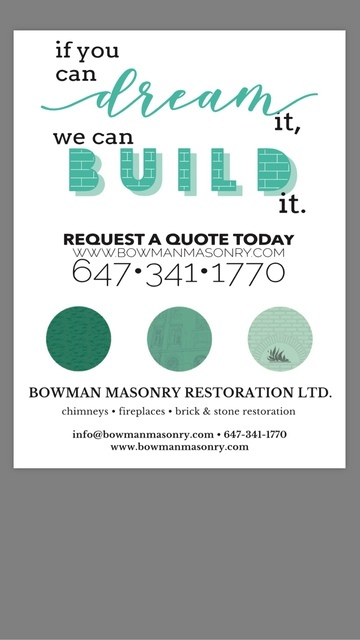 Bob from Bowman Masonry was fast acting and gave expert advice on the options regarding my chimney. The team respected my property and did a great job of removing the bricks from the roof in a safe manner, disposing the materials and cleaning up the area afterwards. Bob was also familiar with the historic requirements and offered advice on how to handle the job. Thanks. I definitely would use Bowman Masonry again. I contacted Guy Bowman on the recommendation of a general contractor. The brick at the base of my house was crumbling and my insurance company required it to be repaired. Guy visited my house and then followed up with a proposal for 2 different options with different degrees of restoration. I chose the option that required more work to the brick and I am happy I did. Guy and his team were professional, thorough and did a great job. They replaced brick which was crumbling and also did some parging. They cleaned up after themselves and even included the removal and re-installation of a decorative metal corner guard at the brick. I would definitely recommend them. They did an excellent job ! I have an old house and it was amazing how they matched the bricks for the chimneys that they rebuilt the same colour of the original bricks that made the house I am very happy ! Thank you Bowman Masonry for a speedy -profe3ssional and beautiful job replacing my chimney. Jason and Wayne both did an awesome job our chimney now has a beautiful profile with perfectly matched bricks. Bowman Masonry you are certainly the best company to work with. Several other companies came to look at the job before and had excuses why7 they could not do the job height being the biggest problem but to Bowman there was no problem. Thanks for your flawless service I recommend your company highly. Thank you so much for your feedback! We very much enjoyed working with you on your project! The work was done professionally and efficiently. The colouring and matching up Brooke was fine and the parching of the clocks looks good. Thank you so much for your feedback and look forward to working with you again! We chose Bowman Masonry as we had seen their work at a neighbours. From day one we were very impressed with the communications we received throughout the project. The team of Craig, Mark and Tony were a pleasure to deal with, they would show up at the same time each day, crack on with the jobs in hand, clean up at the end of each day all while enjoying and taking pride in what they were doing. The work done is of a very high standard, they matched the mortar of the house when fixing a few large stress cracks and doing Spot tuckpointing (my husband had a hard job finding where the cracks had been) - which says a lot about their attention to detail. I would highly recommend Bowman Masonry, in fact, I have to three neighbours who are impressed with the limestone sills, and the Masonry work done. We look forward to working with Guy and his team on a future job at our house. Family owned & operated. 30+ years of experience with jobs from chimney rebuilds to old home restorations. We service Toronto & the GTA. Not only do we pride ourselves on customer service and giving the customer what they want, but we specialize in hard-to-reach chimneys, difficult scaffolding set-ups, and fireplaces. We are a fully-insured company with our staff fully trained in Working from Heights and WHMIS as minimum requirements. Additionally, we employ a WSIB-certififed Health and Safety Representative that ensures that all safety requirements are in for not only our staff but you as well. 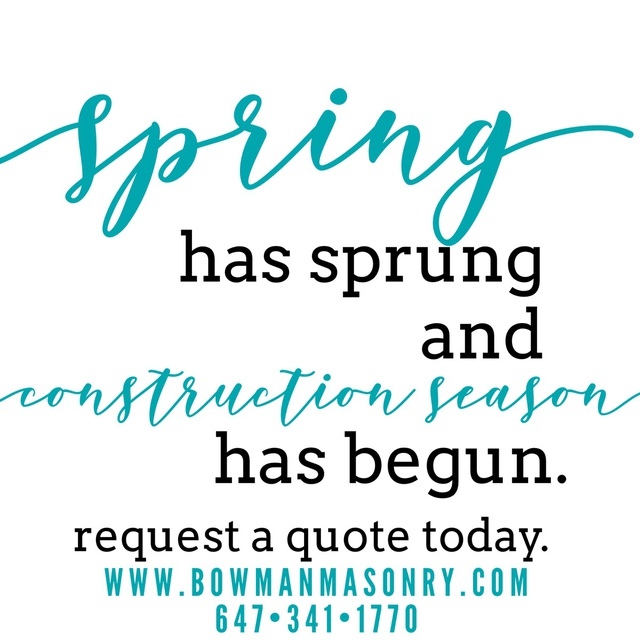 We are a member of CSAO Toronto and a handful of community employment programs (such as Springboard), which allows youth to not only apprentice within Bowman Masonry but have an equal opportunity in the job market.